There are few birds associated with the southwest more than the roadrunner. Specifically, the roadrunner species in the US is the Greater Roadrunner - Geococcyx Californianus. 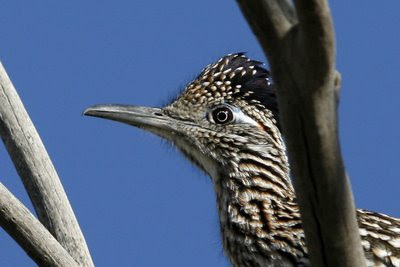 The roadrunner is a large bird - it can reach nearly 2 feet from it's head to the tip of it's long tail feathers. It's probably most noted for it's ability run quickly - nearly 25 mph. This is likely an adaptation to aid it in hunting lizards and snakes. Roadrunners are fascinating birds - aside form their size and unique shape and ability run, they have interesting hunting techniques. They have been documented to occasionally work in pairs to hunt rattlesnakes - one distracting the snake allowing the other to move in. They commonly kill their prey by repeatedly bashing the prey's heads on the ground or rocks. 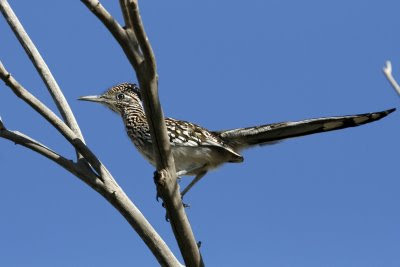 The bird photographed above was spotted in the Santa Cruz Flats region in south central Arizona. This region (named for the normally dry Santa Cruz River), is bounded by Arizona City to the north, Marana to the south, and Picacho Peak to the east. The region primarily a flatland consisting of many farm plots (sod/turf, cotton, pecan groves, and others) and empty arid lots. this combination of natural habitat and the consistent water associated with the farm crops makes for an excellent location for many bird species. In fact, in a brief 90 minute survey of the region, 3 roadrunners were spotted among about 30 total bird species. With a little more time to focus on the seclusive species, it's likely another 5-10 species of sparrow and thrasher could have been identified.